We may feel like our metabolisms keep us looking to sugar for energy to get up and go, but usually the sugar we eat damages the inner workings of our metabolisms. Consuming added sugar turns on the red light for burning fat as fuel. But healthy fats, like avocados, turn on the green light for burning fat as fuel. The foods we eat, how often we eat, how much water we drink, how much muscle we have, how much sleep we get, and how often we exercise affect the flow of our metabolisms. You can improve the chemistry of your metabolism today. You can make small, effective changes that will impact how you look and feel instantly. Eventually, your body composition will reflect your new choices. 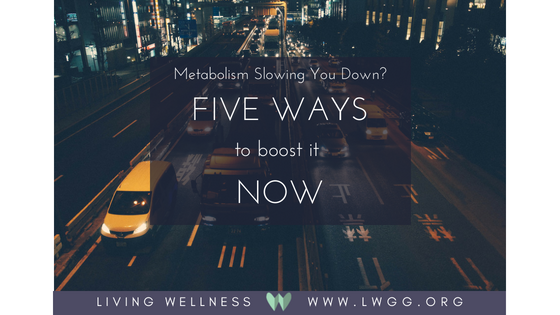 Five Ways to Boost Your Metabolism Right Now! 1. Move your body every day! Muscle is one of the most important factors in the health of your metabolism (the number of calories your body burns in movement and at rest each and every day). The more muscle you have, the more fuel you burn. Muscle burns ten times more calories than other tissue. One pound of body fat burns five calories in twenty-four hours compared to one pound of muscle that burns fifty calories per day, each and every day! Cardio exercise boosts your metabolism for several hours after your workout. In comparison, muscle mass raises your metabolism all day, every day, because muscle burns fat all day long! Does strength training sound more attractive now? Your lean muscle mass is one of the most significant factors in your metabolic rate. Muscle burns body fat! Celebrate! The Living Wellness workout you are practicing throughout these eight weeks is a strength-training, muscle-building workout! 2. Eat breakfast and small meals every three to four hours. You would not expect your vehicle to run without fuel, and you should not expect your body to, either. Breakfast is meant to break the fast. You will feel your best when you go to bed with an empty stomach and your body is ready to eat and be energized in the morning. You should eat something healthy within one hour of waking. If breakfast upsets your stomach, try something with less acid (an egg rather than orange juice, for example). After breakfast, you should eat small meals or snacks every three to four hours—a couple of hundred calories each depending on your caloric needs. 3. Water, water, water. One study published in the Journal of Clinical Endocrinology and Metabolism reports that drinking seventeen ounces of water (preferably filtered) in one sitting increases metabolic rate by 30 percent! Your body uses calories to process water. Remember, you should be drinking approximately half of your ideal body weight in ounces every day. In addition to boosting your metabolism, water is also responsible for bringing nutrients into and removing waste from every cell. Water also aids in digestion, balances body fluids, helps you feel full, keeps your muscles energized, keeps your skin elastic, and flushes your kidneys and liver. Imagine putting yesterday’s lunch in a blender. How would your blender sound when you turned it on? Now, imagine adding 20 ounces of water to the blender—the contents would digest better. Our stomachs and our digestive tracts need water, as does every cell in our bodies. • You will be less likely to get sick. • You lower your risk of high blood pressure and diabetes. • You boost your brainpower and your mood. • Keep a regular sleep/ wake schedule. • Develop a pre-sleep routine. • Reserve the bedroom for sleep and intimacy. • Practice daily exercise to burn off extra energy. • Do not drink to excess or smoke. Identify the points you can work on to start sleeping better. • You think more clearly and do better in school and at work. of car crashes every year. • You will be more likely to attain and maintain a healthy weight. I don’t talk much more about the benefits of sleep throughout this study. But let me assure you, sleep is one of the greatest assets you have to being healthy and avoiding premature aging. I strongly encourage you to create a healthy environment for sleeping. Set a bedtime routine. Make sure you have a good mattress, pillows, and sheets. Where else do you spend so much time in your life? Perhaps only your workplace rivals the bedroom if you work outside the home. Get good sleep. Fight for good sleep. Make it a priority and your health, energy, and mood will improve. 5. Your plate. Your body requires balanced nutrition in order to function properly. Eating processed carbohydrates, such as muffins, hamburger buns, crackers, white pasta, candy, and pizza crust feeds bad bacteria in your gut, which in turn throws off the balance in your body and messes up your metabolism! Intestines and bowels filled with too many processed foods get clogged, inflamed, and damaged. To maintain a healthy metabolism, our plates should be filled with vegetables, healthy fat, protein, fermented food, and a limited amount of fruit. As previously stated, the cells of your body are largely made up of what you feed them. You are what you eat! Likewise, your metabolism functions on everything you eat. If you are consistently overeating processed food and toxins, your body is producing more chemicals to process and break down the toxins. Toxins put stress on every organ in your body. For example, if you consistently ingest too much synthetic salt (table salt), your heart must work extra hard to eliminate the extra salt from the body, stressing it. Too much of anything is tantamount to not enough. Questions for you to chew on. . .
What negative habit is diminishing the effectiveness of your metabolism? What changes will you make to improve the health of your metabolism today? How will you feel when your metabolism is improved? Remember, If you don't already have it, you can get your own copy of the award-winning book here!